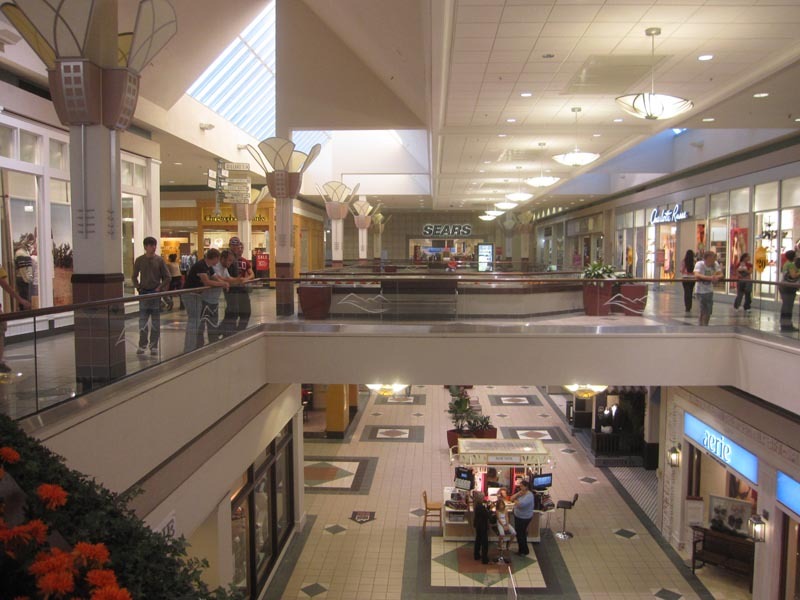 Hickory has well defined itself as the major retail center of the North Carolina foothills region, and Valley Hills Mall is the centerpiece of this. The most upscale shopping to be found is in and around the mall, which arrived with a bang in 1978 and has been going strong ever since. As Hickory's only active shopping mall, it left its former older competitor Catawba Mall in the dust over two decades ago. Today, it is a solid two-level mall with four anchors and plenty of business. Valley Hills Mall is a curious mall in that it was apparently built on a narrow plot of land that required interesting design modifications. 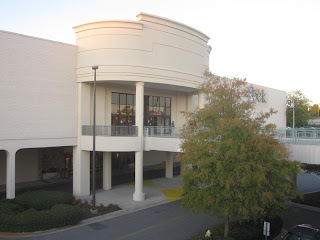 The mall first opened as an L-shaped mall (or a "V" depending on how you see it) anchored only by Belk Broome and Sears. Apparently Mr. Beery (of Belk Beery) built the store, but the ownership was transferred to the Broomes. 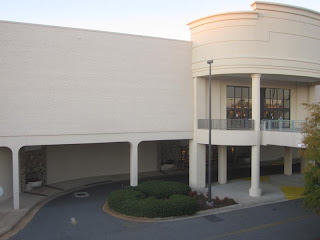 It did not seem at the time the mall was built that the owners were interesting in killing off their older nearby competition, though both malls shared a Belk. 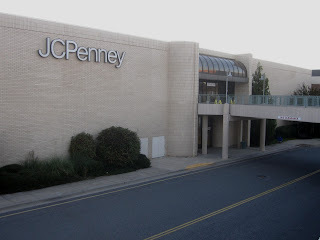 However, it was pretty obvious by that time which mall had more to offer in size and architecture, and its name did not start with a C.
Looking towards JCPenney at center court. The first photo is of center court looking towards the Sears wing. Traversing the Sears wing. Note the style of skylights along the Sears and Belk (original) wings. Sears features the same old mall entrance other than for some reason being completely off-center. Looking back along the Sears wing to center court. Dull Dillard's features the dullest wing of the mall with a dull, boring skylight and bland design unlike the rest of the mall. Valley Hills Mall grew into a dominant mall in the 1980's when JCPenney left its large two-level store at Catawba for a brand new store at Valley Hills in 1988. 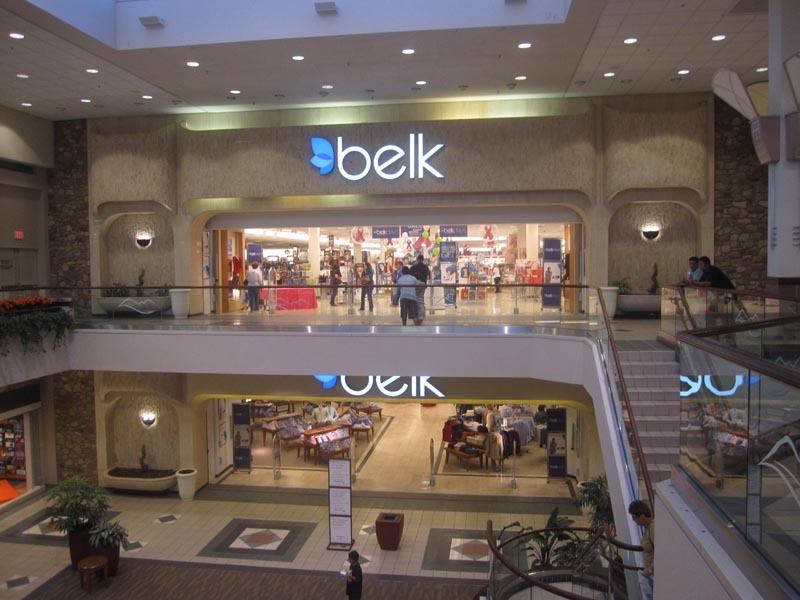 At the same time, Belk consolidated its operations into Valley Hills ending any chance that the two malls would be complimenting each other at all. 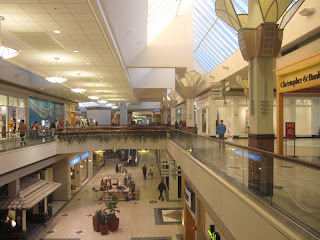 At the time, no other mall in the region had Belk, Sears and JCPenney though the mall would have been more ideal with anchors like Ivey's or Thalhimer's, neither of which the city could apparently support at that time. Spainhour's might have also joined the mall, but at the time they seemed to be looking more into phasing out their department store business. 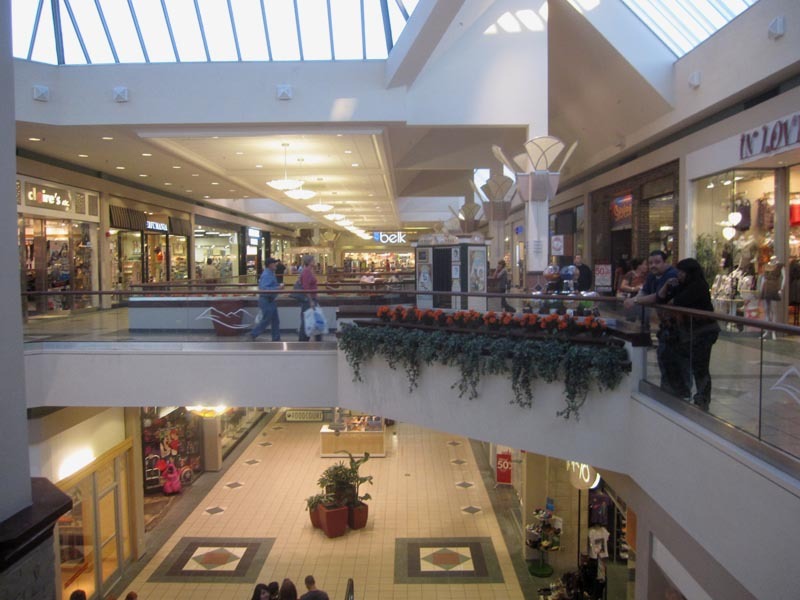 It would still be another decade before the mall would attract a more upscale anchor tenant. The above two photos show the Belk wing approaching the store itself. At the end of the wing is one of the best Belk mall entrances I have ever seen! Looking back along the Belk wing to center court. 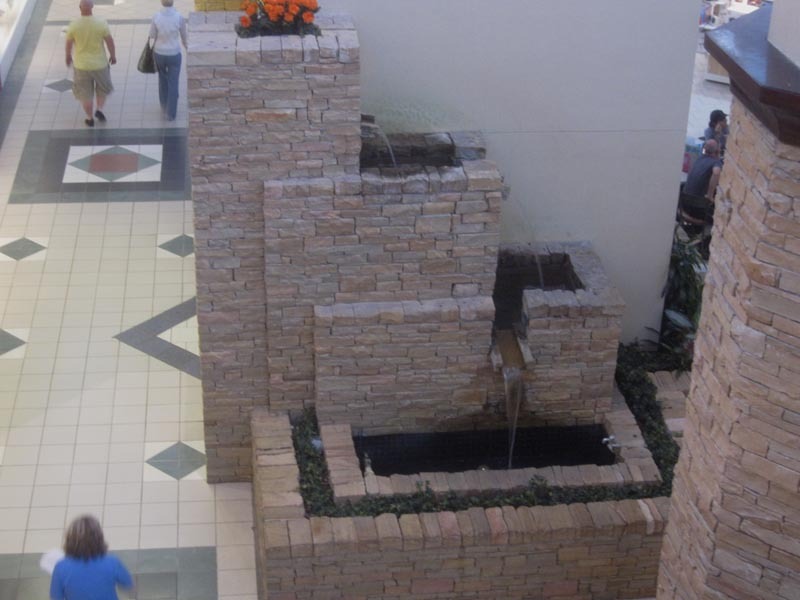 Looking down from the upper level at center court is this very attractive, albeit small, fountain. 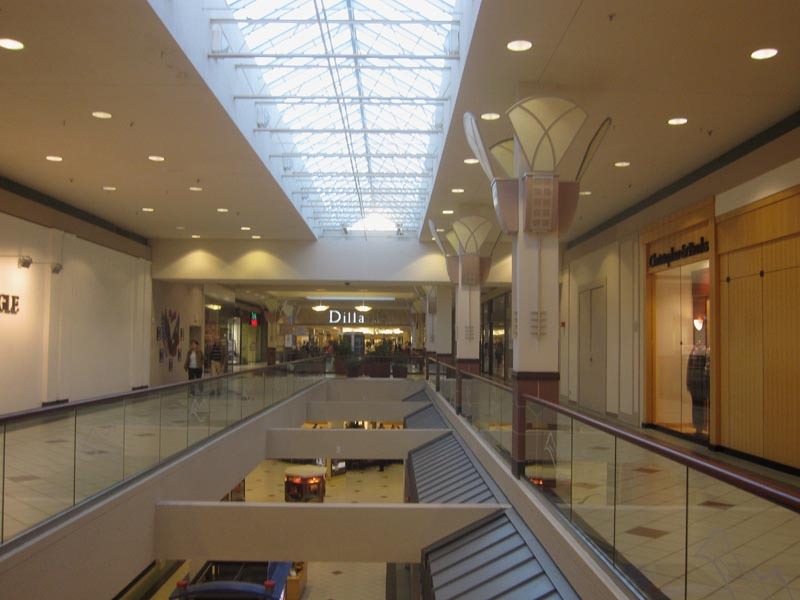 1999 would be the next and last major modification the mall would see. It was in that year that the mall added two new wings. 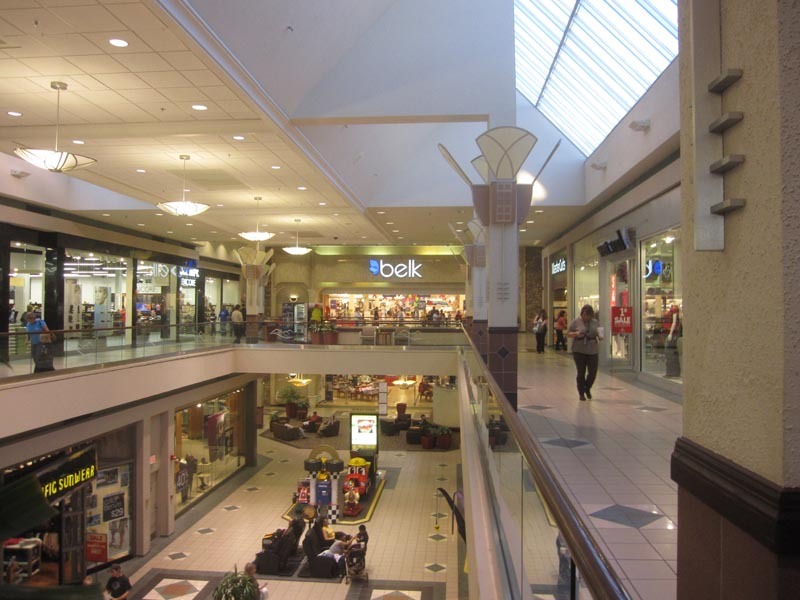 One included a food court fronting a new main entrance to the mall on the north side between Belk and Sears. The second was the addition of a longer wing for a new Dillard's store giving the mall a Z-shape. Dillard's at the time was new to the market, so its arrival was likely exciting for mall patrons. 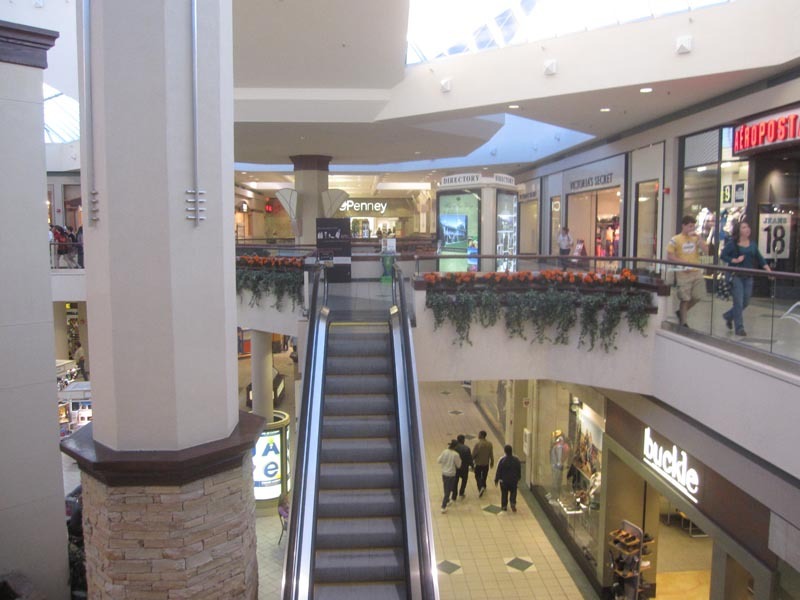 The then-aging mall also received an interior renovation, updated entrances and a new logo. 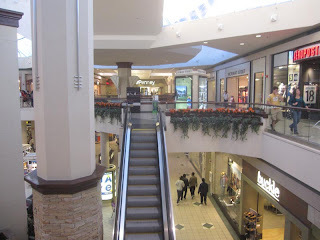 The improvements did not strip away all of the 70's features, but it made the mall seem less dated and sufficiently contemporary. These guys clearly look bored and a bit irritated as the wife clearly wore the pants that day so that she could go to try on some. They were staring into space imagining more exciting ways they could spend their time such as watching football or doing something that involves a hammer or loud machinery. Here is the mall map to explain what is hard to explain. It is an interesting layout. 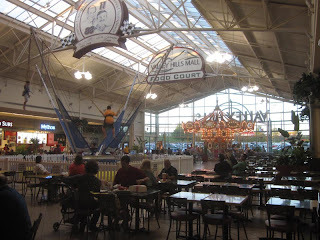 The food court is reasonably attractive and includes a carousel typical of 90's malls. 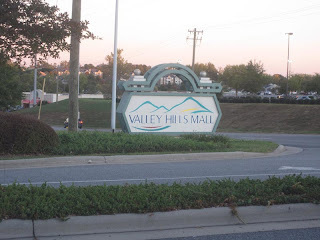 Valley Hills Mall sign along the street. Definitely not the worst I've seen. The name sounds a bit like a trailer park, though. I like the name Catawba better. What does remain vintage at the mall is quite striking. 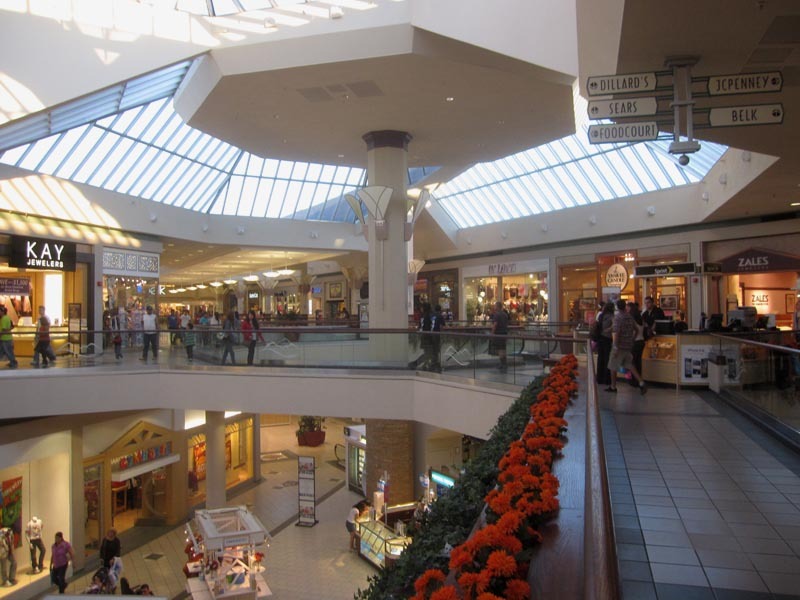 The skylight configuration through the older part of the mall is somewhat SouthPark inspired with its skylights along the sides instead of in the center. The skylights, however, are placed at a 45 degree angle with the roof sloping back down on the opposite side. Bigger, brighter skylights are found in center court. Fake plants give the mall a more lush feel. About the only thing that looks different is the Dillard's wing, which contains a less inspired, more conventional design. 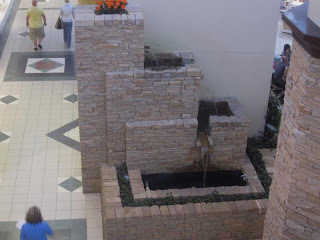 What is also nice in the mall is the small terraced fountain in the lower level of center court. This likely replaced a much grander fountain before, but it is still a nice feature that they did not have to install. 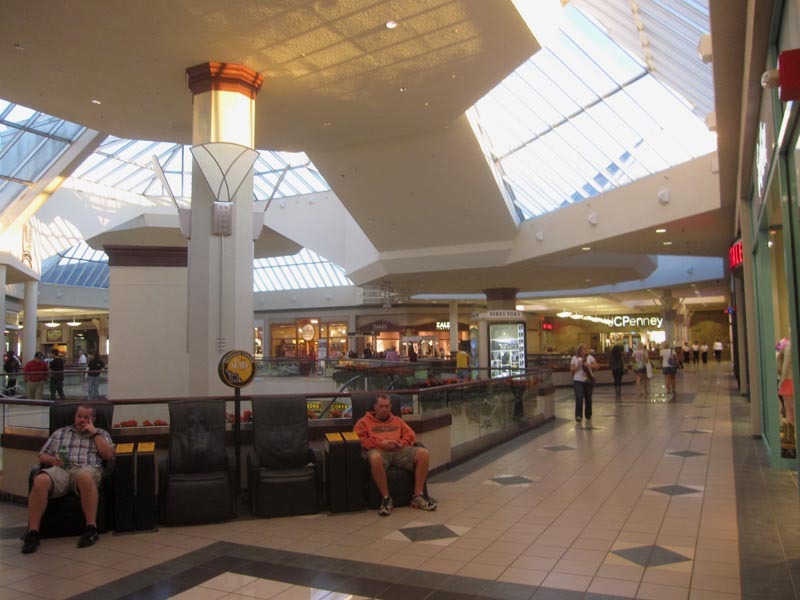 The mall as a whole is bright and cheery compared to the dark and plain Catawba Mall. 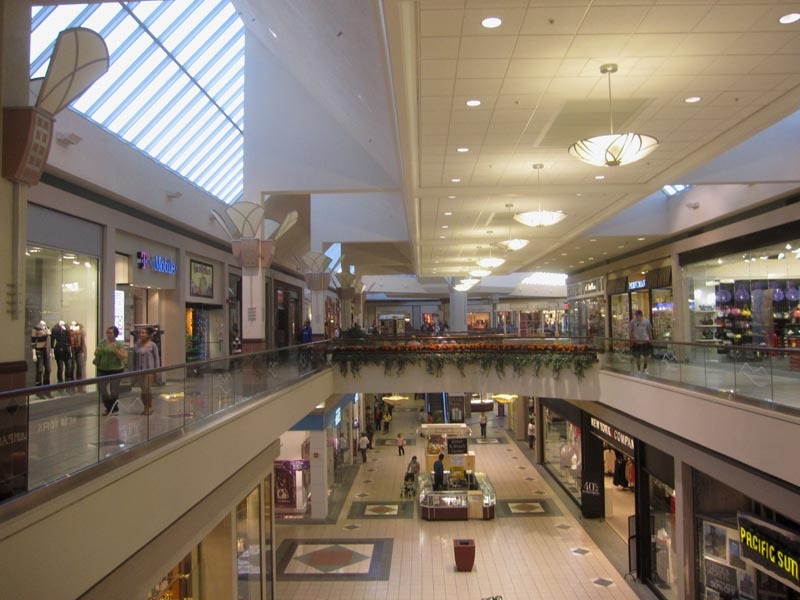 In all, it is a well-designed mall that is a step above the average small city mall. JCPenney arrived in 1988 with a basic but eye-catching exterior shell. A view of Belk from the parking deck entrance. The renovation wasn't great, but some elements remain. The parking deck here was built just for Belk. If you look below you can see some of the original stonework that was retained from when the store first opened. 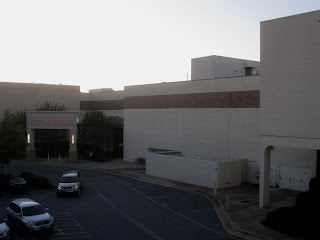 The last photo features the rear mall entrance between Belk and JCPenney. 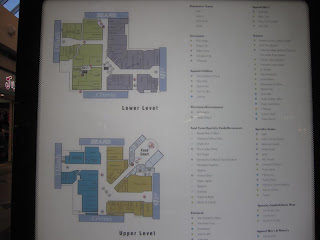 I did not include any photos of Dillard's or Sears because neither store retained any distinctive design elements. 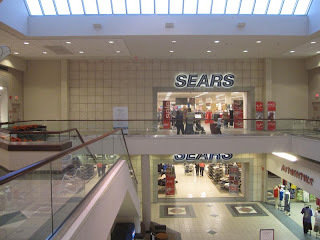 The Sears looked like the typical 90's remodel and Dillard's looked like every other stucco atrocity they've thrown up. Hickory today pulls from a large, although largely rural market. Because of that, the mall will probably never attract more upscale stores or anchors, but for its market is still a far nicer mall than what cities of its size tend to have. Because of that, the mall is fully leased and not likely to be crushed by a large power center or "lifestyle center" project. In truth, it is even nice compared to other malls I have seen in the state, and its ownership by GGP makes it a first-tier mall. My only beef with the mall is that its anchors look bland and boring. Belk renovated away its stone-clad 70's elements, Sears has been upgraded to bleached-out blandness, Dillard's is the usual clone and only JCPenney really seems to stand out although still colorless. The main issue the mall faces in the future is potential failure of 2-3 of its anchors. Sears is on very shaky ground with JCPenney and Dillard's both known to be struggling as well. Management will have to be creative if an unraveling occurs due to that issue. Obviously, many other malls will have this problem but this is a very difficult challenge for malls in second tier markets with fewer stores to choose from. If such a shake-up does not occur, this is a pretty standard, reasonably attractive mall that will likely avoid the worst of the current mall insurrection wiping out so many malls every year. Dillard's must have a Ph.D in Dull. Otherwise, cool mall. This mall kinda reminds me of the Haywood Mall in Greenville South Carolina. Keep the updates coming. 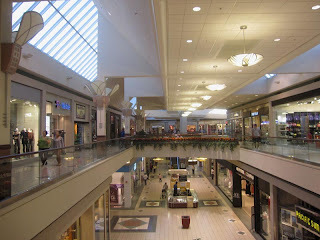 I live in the much larger city of Asheville, an hour away, and can tell you that Valley Hills is a much better mall than the mazey Asheville Mall or the ultra dead Biltmore Square Mall -- even though Hickory is a much, much smaller city. 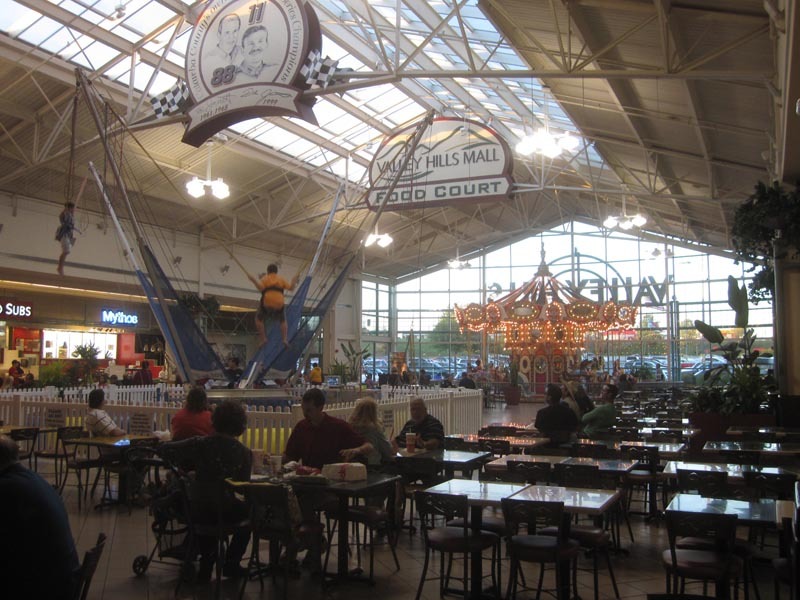 That said, I kind of liked Valley Hills Mall better in the 1980s when it had a Annabelle's Restaurant and Pub, Mom-N-Pops and that cavernous food court. But, you gotta change to stay relevant and Valley Hills deserves credit for staying strong when so many other malls in small NC towns are dead or dying. This mall in the 1990's use to have a indoor putt putt center located on the side of the mall. It wasn't connected to the interior of the mall and was only accessible by coming in through the parking lot if I remember correctly. It was strange. I think that was in what was once the Annabel’s restaurant. In the old days it had a entrance to the mall and to the outside. I dearly wish they had kept some of the late 70s design. The basic pallet was rough-finished concrete that looked like stone, often poured with a ridged pattern. They balanced this with lots of warm dark wood. Those central pillars were the best. They had slats of wood running at an angle from where the skylights started to about halfway down the columns. The result looked like a giant tree. The old food court was awesome. The stores were arranged around the outside and in the center was a raised eating section. There was a pass through at the back to the arcade, which was beside the exit where the Dillard’s is now. On two sides of the eating section there were huge waterfall fountains. The waterfall theme was continued with several fountains in the middle of the aisles. They were essentially a small gazebo with a waterfall and a long pool. The pool was level with the floor and even had stepping stones across it. Lawyers would never allow it today. You can tell I spent a lot of time there in the 80s. Their removal (along with all the amazing architectural features in nearly every other mall) is criminal. What's even worse is that they put all of these special features in then made sure that no pictures were ever available of that for future posterity to see. Wow. I actually found a picture of the original design. WOW! That was really a stunning mall in its original form!